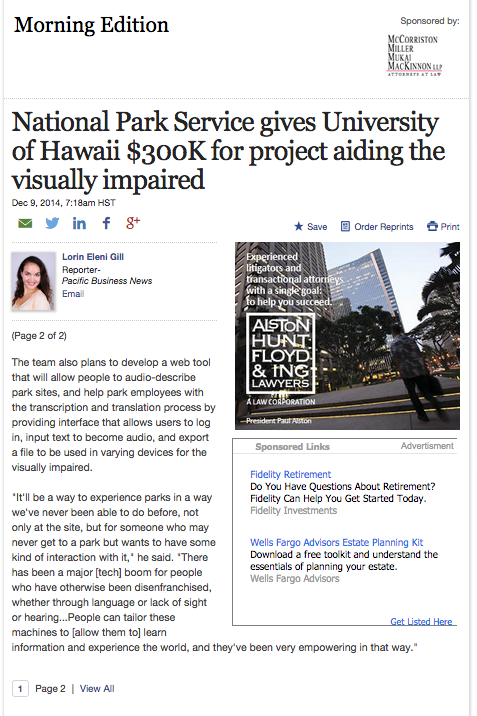 The National Park Service has selected a team of University of Hawaii researchers for a $278,300 grant to develop park materials for visually impaired visitors. 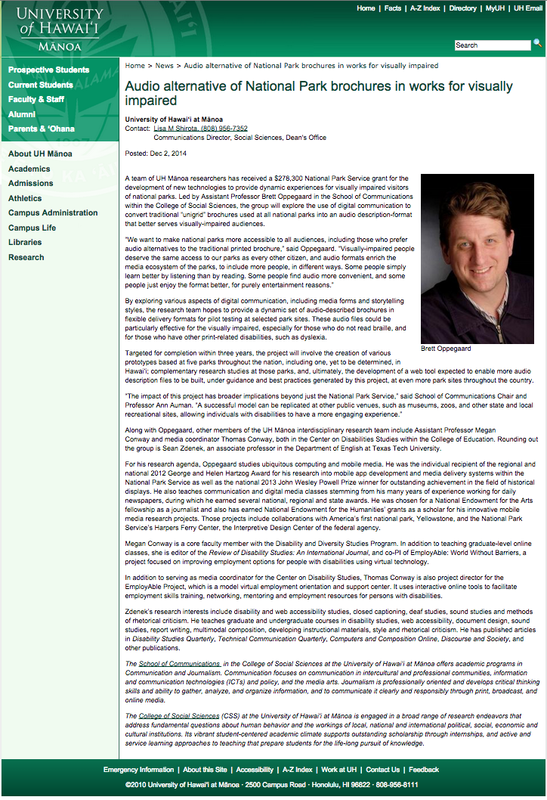 College of Social Sciences Assistant Professor Brett Oppegaard leads the team, which will develop technologies to convert traditional “8-fold” brochures into audio descriptive formats. “There’s transcription, where you transcribe the text on a brochure, and then there’s translation, which we’re most focused on, which is interpreting the experience of the brochure and converting or transforming it into something that can be experienced through the ear,” Oppegaard told PBN. Oppegaard says the team will build prototypes with different audible forms for five national parks, including one in Hawaii, yet to be determined. 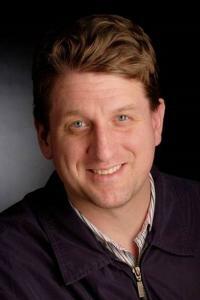 Oppegaard will work with UH Assistant Professor Megan Conway and media coordinator Thomas Conway, both in the Center on Disabilities Studies at the College of Education, as well as Sean Zdenek, an associate professor in the Department of English at Texas Tech University. The federal 1973 Rehabilitation Act mandated the availability of equivalent media experiences for people with different access issues. Audio description for video is fairly common for federal agencies, but not available everywhere, Oppegaard says. The UH team has combined their interests of mobile technology and web accessibility for the disabled to help the National Park Service to create tools for the visually impaired. 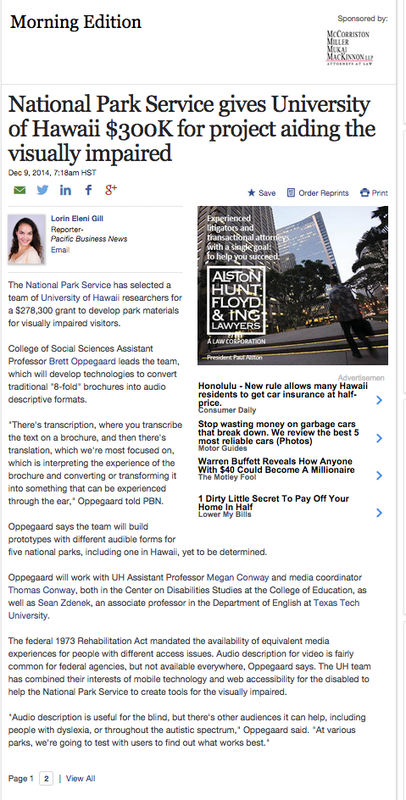 The team also plans to develop a web tool that will allow people to audio-describe park sites, and help park employees with the transcription and translation process by providing interface that allows users to log in, input text to become audio, and export a file to be used in varying devices for the visually impaired. Posted: Wednesday, December 3, 2014 10:01 am | Updated: 5:53 pm, Thu Dec 4, 2014. 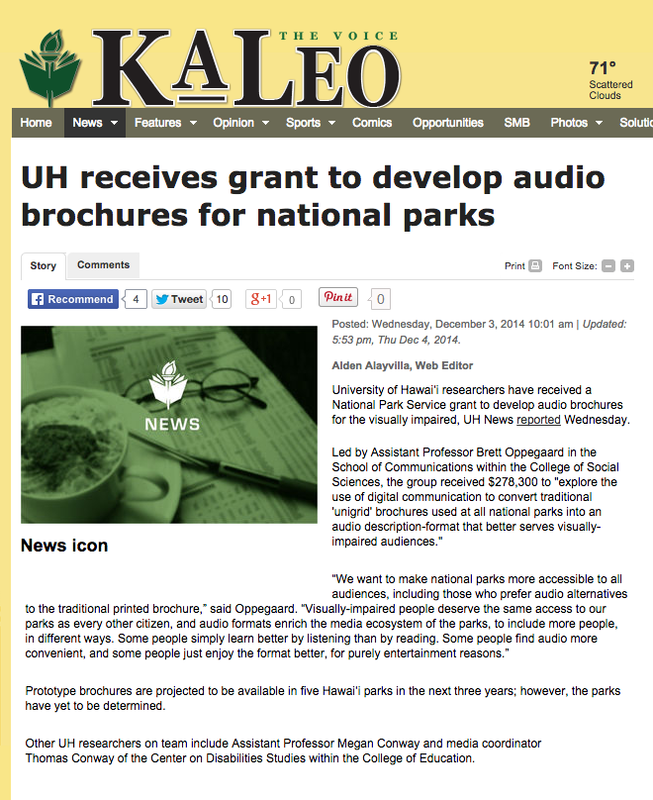 University of Hawai‘i researchers have received a National Park Service grant to develop audio brochures for the visually impaired, UH News reported Wednesday. Targeted for completion within three years, the project will involve the creation of various prototypes based at five parks throughout the nation, including one, yet to be determined, in Hawai‘i. Other UH researchers on team include Assistant Professor Megan Conway and media coordinator Thomas Conway of the Center on Disabilities Studies within the College of Education.